5/8'' long leaves that are whorled along the length of the stem, commonly 4 to 8 leaves per whorl. 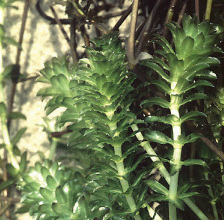 Edges along the leaves are lined with sharp teeth. Have a dull-white to yellowish potato-like tuber along the roots. Can grow in lengths over 25'. 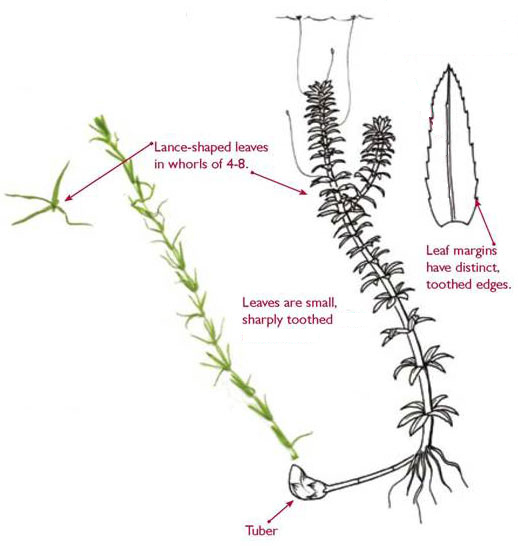 For Hydrilla to reproduce, it only takes a piece of floating plant material to set roots. The tubers can develop along the stem, which help overwinter the plant by holding food for the plant to survive. These are found 2'' to 12'' below the sediment surface. The plant can grow as fast as a foot a day, but with warmer temperature it can grow an inch a day toward the surface. Once at the surface, Hydrilla forms thick mats which blocks out the sun for the native aquatic plants. The thick mat creates more problems for fish, the stratification of the water column and the decreased dissolved oxygen levels can be toxic, also a reduction in fish weight and size because of the lack of open water and natural vegetation. People will start having problems fishing, boating and swimming in these thick mats. Avoid passing through thick beds of vegetation. Check all boating equipment before entering the water. Remove all plant matter, dirt, mud and other material above the water and on dry land and AWAY from any water, and dispose of in a trash can. Clean and dry all equipment thoroughly before visiting other water bodies. Open the airlocks on shells and air bladders on kayaks after each use, and allow to dry. You have to remember that Hydrilla can survive in moist conditions for several days. So it is very important that you take the time to go through these steps. Jackson Karns and Elaine Dalrymple with one of the many awareness signs in the county.